Students and parents new to classical education are often led astray by the misconception that a classical school emphasizes the humanities over the sciences. 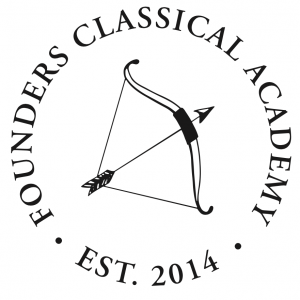 At Founders we believe that a true classical school must provide a well-rounded education, and that in teaching students to pursue knowledge the pursuit of knowledge and mathematical knowledge is just as important as the pursuit of knowledge about the humanities. Science, at its heart, is the pursuit of knowledge about the natural world–the study of nature. Whether we’re studying the bodies of living organisms (biology), the principles that govern the movement of objects here on earth (physics) or in huge objects in space (astronomy), or the relationship between one tiny molecule and another (chemistry), we learn that the no matter how big or how small things are, the natural world operates according to certain principles. We also learn that nature can be shaped and influenced but not ultimately controlled by human beings. A good science education asks thought-provoking questions about the relationship between human beings and the world they inhabit–for example, questions about how much we should or can control our environment, or about the differences between human beings and animals (more difficult to articulate once you learn about the similarities between human bodies and animal bodies in a biology class). These are invaluable lessons for any student of human nature who is fascinated by a literature, history, or philosophy class, and many great works of literature are explicitly about this question. (In 12th grade literature right now, I am reading Shakespeare’s The Tempest with the students, in which the protagonist has magical powers that allow him to control the physical world.) At Founders we strive to show students that knowledge is knowledge, and what one knows through science fits together with what knows through studying literature or reading philosophy. A well-rounded student has to study both. Parents are always welcome to come and observe a class, and I encourage you to visit one of our excellent science and math classes at some point this semester. Our front office team will be happy to arrange a time for you to stop by, and warn you if there is a dissection scheduled in Mrs. White’s anatomy class!